Note #1: In this… Article 2 The Next Epic Novel And Feature Film Trilogy On Earth …it should have stated…Book…instead of…Novel. This is true because the book is fictional only to the degree that certain character names and some locations of events have been changed to protect the vast majority of innocent people on planet Earth today from encountering off-world tyrants. What drives them to be diabolical tyrants is currently in the process of beings removed but this will be universally revealed after the completely unexpected, uplifting worldwide transformation to planet Earth and its suppressed human population is more openly underway. The days of the stratospheric successes of such epic series of feature films like Star Wars, Star Trek, The Lord of the Rings and The Hobbit, as well as the Harry Potter series, based on the completed publications of the seven book series, and numerous other block buster films are virtually over. Now it is time to bring to the table of the feature film business even more enjoyable and enlightening feature film adventures. In this author’s view, there does not appear to be any more currently published book trilogy stories or other book series stories that have tremendous potential to be made into uplifting consciousness expanding phenomenally successful worldwide feature films which have enlightening elements woven into them. However, on the horizon is an emerging new hidden truth revealing epic adventure trilogy story that just could be the next major step books and feature films will go to inspire, uplift and awaken ever expanding awareness in several hundred million or even billions of new fans worldwide. These fans will include those who are now or have been fans of the past book and feature film adventures listed above, among many other highly successful TV series that have come and gone like Stargate SG1, Stargate Atlantis, The X-Files, Babylon 5, and several others. You can explore many other unique hidden truth revealing aspects at this website including the music Scott created, which includes the song composition titled, Lemuria. This production gradually inspired the author’s development and writing of The Parallel Time Trilogy screenplays and books, as well as his latest book titled The Seres Agenda. This book is based on the author’s true-life experiences with parallel and higher dimensions, mostly benevolent extraterrestrial beings, and what was discovered that was recently green-lit off-world that will transform the people of Earth and the planet in an entirely unexpected uplifting benevolent new manner in the near future – instead of allowing it to be destroyed. The Parallel Time Trilogy story is uniquely unlike the Star Wars stories that were centered five million years ago far, far away in another galaxy. They are also quite different from the Star Trek series centered in the distant future relative to Earth, and The Lord of the Rings trilogy with the Hobbit book prequel that appears to have been centered in a mythological distant past on Earth, or perhaps in parallel dimension. The Parallel Time Trilogy books, and planned feature films based upon them are centered in present time on our own planet Earth. They are entirely based upon the author’s direct experiences with benevolent and malevolent extraterrestrials spanning this and numerous other lifetimes on Earth and on numerous other planets. Revealed in the trilogy story is a very significant aspect of most ancient hidden Earth, solar system, and galactic history and the galactic past and future time track. The experiential journey through its pages discloses for the first time the purposefully hidden history of our planet, and where we are headed in the near future that involves both benevolent and malevolent extra-terrestrial beings. Based upon this author’s direct explorations, the three-part story reveals the protagonist and antagonist (good and bad extraterrestrials) as they go at it for the survival or complete destruction of our planet, while the masses of humanity (for the most part) remain unaware of this as they go about their daily challenging lives. Many mystical experiences, and unexplained phenomena that human beings have had throughout recorded and unknown history, are plausibly resolved for the first time in what the Author calls a hidden-truth revealing epic adventure trilogy story. 1.) The UFO phenomenon more deeply revealed dealing with both benevolent and malevolent extra-terrestrials, and how Earth is important to them. 2.) The actual hidden unknown history of our solar system starting 100,000 years ago is explored, just before and after the last polar shift of our planet occurred, and why there is an asteroid belt circling in the orbit of a planet between Mars and Jupiter in our solar system today. Long ago, it was a vibrant planet with many thriving beings living upon it before it was exploded into rubble to become the asteroid belt. 3.) Hidden inter-dimensional doorways on Earth are revealed that lead directly into a number of different realities. These realities co-exist in a parallel time that is normally not perceived by us. Some of these hidden doorways also connect to planets that are located somewhere in the vast arena of outer space, and to higher dimensional realities. 4.) The regular cyclic changing of Earth’s poles overnight every 100,000 years is revealed that caused the sinking of the mysterious ancient continent of Lemuria 100,000 years ago, along with most of its primary colony continent referred to as Atlantis; all but a five hundred mile wide volcanic island that remained above the ocean waves. This Atlantis island that is familiar to most people subsequently developed into a great world colonizing power before it too sank beneath the waves thirty-five thousand years ago through the misuse of science. No trace of its existence remained above the surface churning waves in what we call today the Atlantic Ocean. 5.) What Soul really is that is referred to in hidden esoteric circles on Earth and off-world as the Atma, as well as how this appears and what it is like to have fully conscious out-of-body-travel experiences. 6.) Off-world anti-gravity, and crystalline based technology is explored. 7.) Also disclosed is the existence of benevolent extra-terrestrial human and humanoid races, malevolent off-world totalitarian races, as well the existence of an endearing silica-based species that developed the natural ability to defy gravity and fly through the air. The above story elements are just a few of the startling new eye-opening revelations that are revealed in just book one of The Parallel Time Trilogy series titled The Emerald Doorway (Three Mystic Crystals). Note #2: This is something I wish to impart to you – the readers worldwide. A true glimpse of this experiential-based knowledge is clearly revealed in the books and videos presentation conducted by R. Scott Lemriel at various international hidden truth revealing conferences held around the world. The Seres Agenda final 4th edition published July, 2015, with the very special techniques section added at the back, is designed to greatly benefit the readers to be able to explore and awaken deliberately hidden truth by their own direct experiences in a safe protected manner. The book is available at various online retailers linked directly to this website. 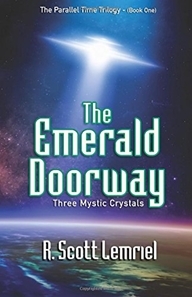 The Emerald Doorway (Three Mystic Crystals) book one of The Parallel Time Trilogy published on December 6, 2015 is also available, as well as the Stranger On A Lost Island music CD album by R. Scott Lemriel. This is the 1st of 7 planned original music CD album releases. Please be patient and stay tuned by checking back to this… Article 2 The Next Epic Novel And Feature Film Trilogy On Earth …page within this unique unfolding website at further uplifting developments arise that will be of wondrous beneficial nature to you. You are wished the most amazing and rewarding adventure during this lifetime and beyond. You can explore other articles found by clicking on the Articles drop-down menu that appears when you click on the New menu tab at the top of this page. R. Scott Lemriel has conducted extensive personal explorations into purposefully suppressed hidden truth from early childhood onward throughout his adult life . He has extensively traveled along the hidden mystical time-track and into numerous parallel dimensions and higher dimensional realities, and had numerous direct contacts with highly spiritual and technologically advanced extraterrestrial humans and other off-planet benevolent races.Today, he continues his unrelenting research into uncovering ever more deeply, experiencing, and then realizing with knowing certainty hidden truth. According to Scott, whether they know this now one not, all human beings living on planet Earth today have the potential to awaken their own direct experiential knowing certainty regarding deliberately hidden or suppressed truth – given the right circumstances. All his project developments are centered around a deep passion for discovering hidden truth for the benefit of all life and all that exists. His book and screenplay writing and rewriting, as well as envisioning, planning, and then implementing of an ongoing unique worldwide promotional strategy is carried out to provide ways for ever larger numbers of fellow human beings living on the backward misdirected planet Earth to have their own direct experiences of awakening knowing certainty in contrast to remaining in doubt, fear, speculation, and theory. The Seres Agenda book is based upon the author’s direct experiences from the age of 3 1/2 years old onward throughout this lifetime with mostly highly spiritual and technologically advanced benevolent extraterrestrials, and the Master being that instruct them that the majority of the world’s people have no clue existed at any time. This book is all about something entirely new that was recently green-lit off-world. It is now underway to openly transform the people of Earth in the very near future in wondrous uplifting ways – instead of allowing the planet to otherwise be destroyed. The story is fictional only to the degree that the names of characters and locations of certain events have been changed to protect the innocent on Earth until this coming benevolent worldwide transformation is more openly revealed worldwide. Note #3: R. Scott Lemriel is his official pseudonym pen name for his copyrighted books, screenplays, and music on deposit at the Library of Congress in Washington, D.C. As a direct experience-based hidden truth revealing researcher, Scott is a book author, short and feature film screenplay story developer & writer, and a documentary film producer and feature film developer with a TV writing and directing background. In addition, he is a music composer, music CD album producer, lyricist, guitarist, piano player, singer and sometimes performer.